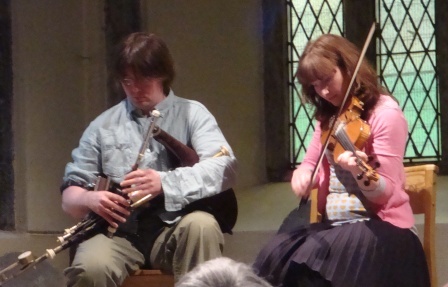 As we all strive to follow that old adage learn something new every day, I learned several interesting things about instruments at this week’s Tunes in the Church concerts. Although I enjoy listening to the pipes, whether traditional bagpipe, the triple pipe, or the Irish uilleann pipes, I hadn’t really paid enough attention to discover that the Irish pipes had a two octave range chanter versus the bagpipe which has a single octave. The uilleann pipes also allow simple chords to be played using keys. I knew accordions and concertinas had reeds, but not much more than that bare fact. I now know that different accordions have differing number of reeds per note. The average accordion, used in Irish traditional music sessions, has about 3 reeds per note. 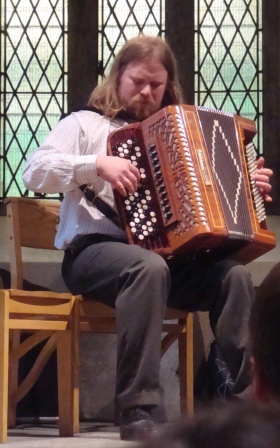 The large accordion, pictured below with Andres Trabjerg, has 4 reeds per note (and a significant number more notes, as well). The first tune he played on the instrument echoed the music of a pipe organ. He also brought a sparkling 1920’s dancehall version which has 8 reeds per note (and an even smaller number of keys). The abundance of reeds in the glitzy version increased the volume of the notes so they could be heard in a large dancehall which could have upwards of 500 patrons eager to strut their stuff on the floor, but would drown out fellow musicians in a pub. In case you’re wondering, Andres is not Irish but Danish, though he has lived in Ireland for at least a decade. While there is plenty one could learn about the accordion or the uilleann pipes, were one so inclined, reading an article isn’t half as much fun as hearing it from devoted musicians. 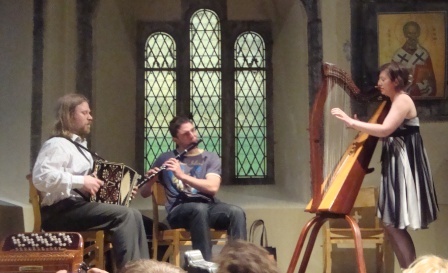 You may also notice in the photo of Úna Ní Fhlanagáin below, that her harp has a four legged base as an attached stand. Never having seen anything like that before, I naturally had to ask. She explained that it had been made especially for her as she is not only a harpist but a singer, and wanted to be able to stand, play, and sing. While some harpists may be able to sit, play, and sing, this particular arrangement worked best for her. Not only are these people talented, but innovative as well. Although the music itself is my primary motive for attending, I am equally fascinated with the stories and informational tidbits that arise from these gatherings. Information you may never receive from a pub session or even concert hall.